If you missed this event and would like to make a donation, please Make a Donation Online. The DeGregorio Family Foundation for Gastric and Esophageal Cancer seeks to promote and facilitate education and collaborative research on the pathogenesis, early diagnosis, and treatment of Upper Gastrointestinal Malignancies. Upper Gastrointestinal Malignancies – including cancers of the stomach, esophagus, and the gastroesaphogeal junction (GEJ) – are responsible for over one million new cancer diagnoses worldwide, and are the second most common cause of global, cancer-related deaths. In the United States, despite the near epidemic rise in GEJ malignancies, these cancers remain Orphan diseases – underfunded and under-researched by the medical community, and largely by the pharmaceutical industry. The scope and depth of the current research into understanding the biology and etiology of stomach and esophageal related malignancies does not match the enormous global scope and impact of these diseases. The field is in desperate need of, and is ripe for medical advancement. 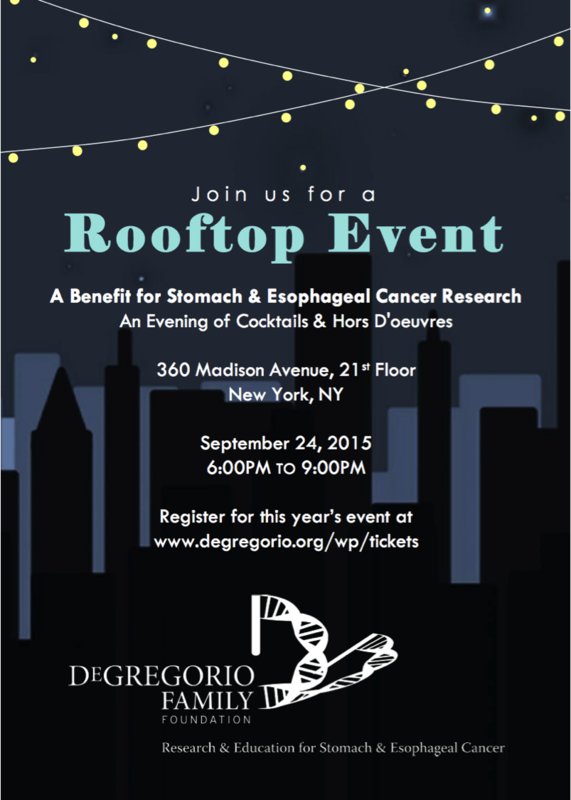 The purpose of the DeGregorio Family Foundation is to fund research and education, and to encourage collaboration amongst researchers in order to facilitate earlier diagnoses and novel treatment therapies for stomach and esophageal cancer related disorders. The DeGregorio Family Foundation seeks to shift the tide and strive towards the goal of containment and treatment of these cancers. Photography will be by KM Captured. DFF is excited to announce that they will be hosting a Silent Auction and Raffle during their Cocktail Party!